I'll 'fess up. I feel jealousy and envy. Who hasn't? Even the people who supposedly "have it all" are just as prone to jealousy and envy as anyone else. What could I possibly feel envy about? Envy is about wanting something that someone else has. I could maybe (hypothetically) feel envy about bloggers who are more successful than me, women who are younger than me, women who have more children than me, people who have no children at all and have all kinds of leisure time, people who seem to have it together--more so than me, women who are in better shape than me, people who have nicer things than me, etc. etc. etc. Since jealousy is a bit different than envy, what might I feel jealousy about? Jealousy is more of an insecurity about losing something or someone. I could maybe feel (again, hypothetical) jealous of the girl that my husband seems to think is so very funny and entertaining at a social event, jealous of those who might be invited to an event that I'm not included in, the new person that just got hired and has struck up a friendship with one of my best work friends but not so much with me, my dog who seems to love my husband more than me, my boys b/c they love each other more than they seem to love me, etc. You look at these things and think, wow, how time-consuming! What is the problem with having these kinds of thoughts and emotions? It's just that these things crowd out any kind of gratitude for what one does have. Any feeling of satisfaction in your life circumstances is negated. These are negative feelings and they can actually become obsessions. They are energy sappers and goal minimizers. Yes, envy and jealousy can definitely spur one on to obtain objects and possessions. But to what end? If you can't conquer the tendency to be jealous or envious, do you suppose that obtaining the thing you were envious about will be the end of the road? Probably not! It will be on to the next conquest that you are now jealously obsessing about. Having recognized this awhile ago, I've learned to do some damage control whenever I realize that these tendencies are popping up into my subconscious. 1) Have a gratitude book. Make a specific journal or art book that only talks about things that you have in your life, which you are grateful for! 2) Don't obsess about it. Admit that you are feeling envy or jealousy and move on, and don't judge yourself for it. 3) Prayer. Make it a point to pray about things you are having trouble with, and ask God for help to overcome the negative emotions. Don't stop until you can feel the feeling dissipate. I believe in the power of prayer and the only time I have seen prayer not work is when I haven't spent time praying! 4) Make the decision to not act on your feelings. 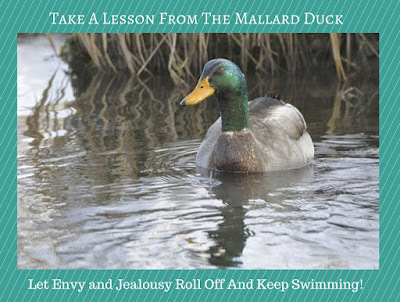 Be the better person and let it roll off your back, like that wonderful analogy, "water off a duck's back." Everyone feels negative feelings. It's what we do with them that counts! Let's take a new look at that mallard duck! What are some other examples of envy and jealousy that you come across? What are some solutions you might have to overcome it?